Officials in Arnold Schwarzenegger's Austrian hometown of Graz have removed his name from a football stadium in an ongoing row over the US death penalty. The large metal letters were taken off the arena overnight. The California governor has said he no longer wants to be honoured by Graz, where he has been criticised for denying clemency to a death row inmate. Former movie star and bodybuilder Arnold Schwarzenegger is one of Austria's most famous sons. The 15,000-seat arena in Graz has now reportedly reverted to its original name of Liebenau Stadium. Mr Schwarzenegger refused to use his gubernatorial powers to intervene in the case of Stanley "Tookie" Williams, a former Los Angeles gang leader executed for murder earlier this month. Graz assembly members condemned Mr Schwarzenegger's support for the death penalty, which is illegal in Austria, and called for the city stadium bearing his name to be renamed. 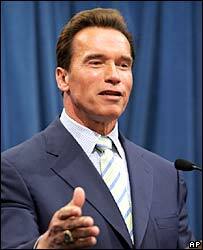 Mr Schwarzenegger hit back with a letter to Mayor Siegfried Nagl, saying he wished to spare the city's politicians "further concern" by withdrawing their right to use his name for the stadium. The mayor last week urged him not to cut ties with the city. Mr Schwarzenegger said he would be returning by post a "ring of honour" the city awarded him in 1999. A naturalised US citizen, he was elected governor of California in 2003 and has confirmed he will seek re-election next year.